Transporting a sit-on top kayak is very easy. Most vehicles and roof racks allow you to load your sit-on-top kayak upside down. This is the best way because it prevents denting the bottom of the kayak and the kayak sits nicely, simply use two tie downs to strap it to the roof bars. 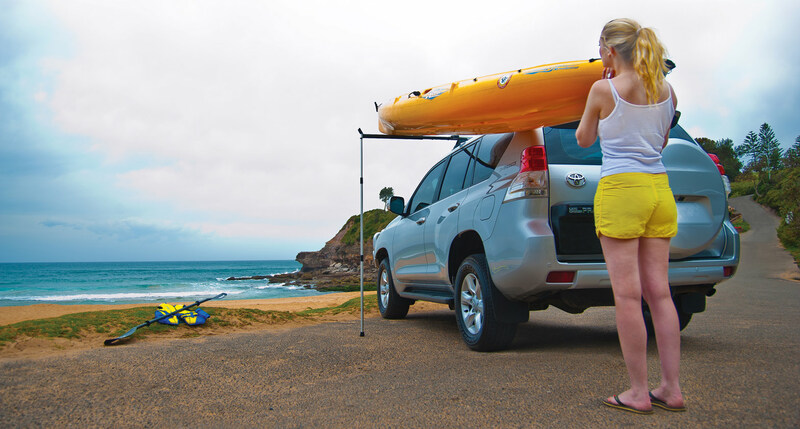 If the design of the kayak, or if the roof rack bars are very close to the roof, then you may need to load the kayak with the cockpit facing up, you will need to use cradels to support the hull or it will get dented if resting directly on the roof rack bars. Normal roof rack bars are all thats required for one kayak but if you are looking at taking 2 kayaks regularly then it might pay to get wide roof rack bars (1500mm) so that they can lie side by side or you can use 'J' Bars whereby the kayaks rest on their sides. You can also use a side loader if you find your kayak to heavey to lift (photo below) you lift one end on to the attached bar, then lift the other end on to the roof racks, then move the first end across and on the the roof racks. Wider bars (1500mm) allow two kayaks to sit side by side, this is usually the easiest and lowest cost option. J Bars allow you to fit two kayaks on standard width bars. Side loaders make lifting the kayak on to roof racks much easier. Foam cradles will reduce denting the hull by spreading the weight of the kayak more evenly.